What is DIY Mediation? 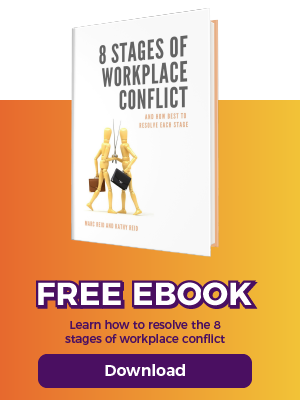 A practical conflict resolution toolkit combining four key skills and a simple step by step process, enabling you to resolve workplace conflict using a mediation style approach. Our video below gives you a brief overview of the key elements of DIY Mediation. Who is DIY Mediation for? Primarily HR professionals but it is also suitable for line managers or anyone who wants to resolve low level conflict themselves. What are the benefits? Using DIY Mediation to resolve conflict saves time and money and prevents the damaging costs of conflict. It is also a way to develop your skills and provide a better service to line managers. We are running a free webinar on 16th May 'Mediation Toolkit for HR Consultants' where we'll be talking about DIY Mediation. To sign up for the webinar click here. Start today with our online learning series. Click here. We run a Masterclass one day training programme. Click here. Buy the book 'DIY Mediation. The Conflict Resolution Toolkit for HR'. Click here. If you would like to find out more about DIY Mediation, one of our free Infobites 'What is DIY Mediation' gives you a thorough insight. Register here to access the free Infobites. It you have read our book 'DIY Mediation. The Conflict Resolution Toolkit for HR' put your DIY Mediation knowledge to the test by taking our online assessment. To do so, first register on the website, and once logged in return to this page and click here to take the assessment. Complete it successfully and you can download your personalised DIY Mediation certificate. You can also buy the Additional Tools and Resources such as downloadable forms and video demonstrations of the AGREE model. Click here to find out more. A simple way to learn DIY Mediation with 20 short, easy to follow videos together with lots of helpful tools. Start learning today. ‘DIY Mediation. The Conflict Resolution Toolkit for HR’ is the comprehensive book by Marc Reid, which guides you through the skills and process of DIY Mediation. Sign up to receive a free chapter. A one day workshop with Marc Reid, training you in the skills, process and tools of DIY Mediation including role play and feedback to ensure you are ready to put DIY Mediation into practice. On DIY Mediation and the online learning series. Sign up here to start our DIY Mediation Online learning series today.